Posted January 23, 2017 by HPGhotrodLogin & filed under Uncategorized. 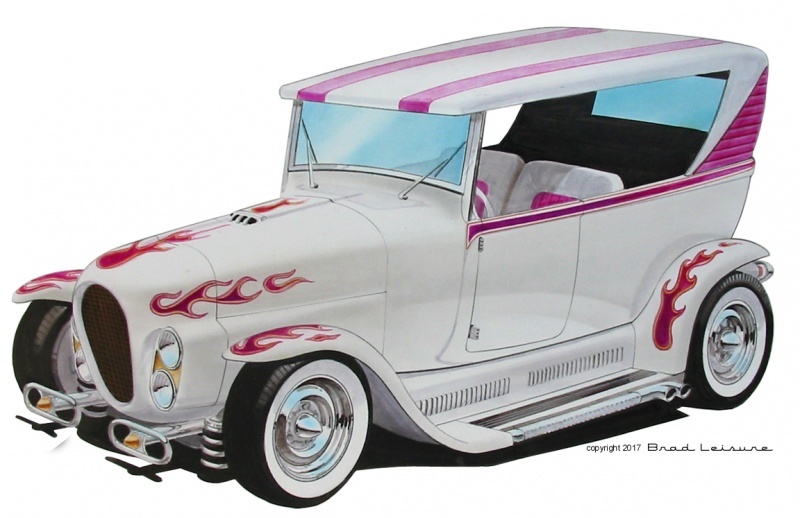 Besides writing and illustrating my Hot Rod Bunny books I’ve provided artwork for magazines and industry. For decades I was a contributing writer for various car magazines and the model car magazines such as; Scale Auto and Model Cars, let me get away with all sorts of weird stuff. As long as there was a kit available to for the reader to make my creation I pretty much had free reign. Well, after countless articles on stock vehicles, I decided to put my own spin on someone else’s inspired show winner. Here are some of the ideas I came up with over the years. This was the L’il Coffin custom Ford sedan that I changed slightly. I decided that the kit version by Monogram needed to be a coupe or a pick-up. Since the original car is was a sedan and the new truck version would be based on a car… we could pretend it originally had been a stock Ranchero or El Camino in some weird twisted alternate universe. I started out this project by trying to figure out how much area behind the seat I could use. I then moved the back of the cab forward until it was about 1/2 inch or so behind the seat. The cargo area still wasn’t long enough so I added about ¼ inch to the length of the bed and this gave it a little more rear overhang. When you move the roof forward it raises the windshield header. This was OK with me because I thought the original was a bit claustrophobic. The roof will need a lot of modification to retain the original look with the vinyl center section. The bed is, of course, completely useless but it looks cool. I opted for a white bed cover and “coffin rails” to give it that vintage Monogram feel. The rest of the rear body is pretty much stock until you get to the front. I never really liked the strange looking cowl and those two big pie plates on it. To me they always looked like twin high-gain antennas from the original Enterprise. My other motive for changing the cowl was to facilitate a partial hood. This was tricky because the grill assembly is extremely low and if you project a normal hood line, it terminates above it. I tilted the front grille assembly to point down slightly so the sidelines paralleled the projected hood line. I then intentionally let the hood miss-match the grill assembly thus creating a scoop for the headlights. I called it the L’il Camino! The illustration was done on Canson colored paper using art markers and colored pencils. 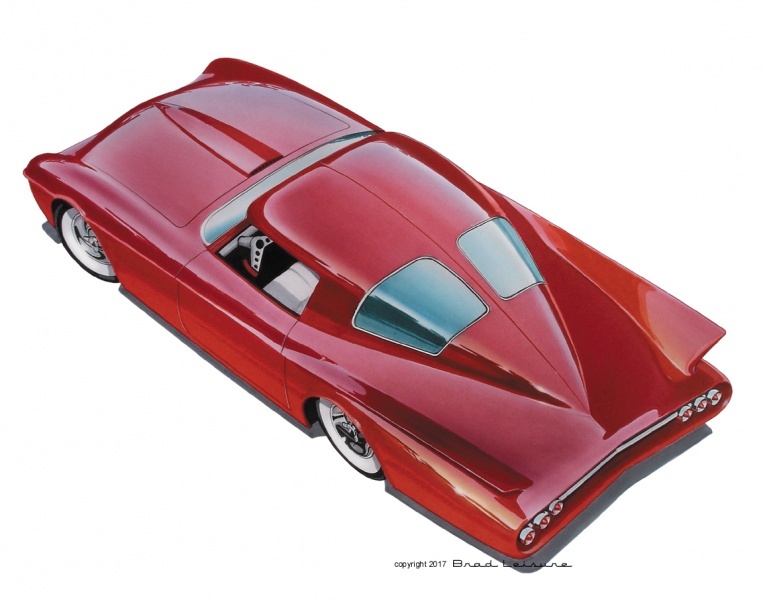 Darrell Starbird’s ’57 T-Bird based Predicta is probably one of the best-known icons of the 60’s custom car world. Both it and the Silhouette are instantly recognizable just by their profiles. Now, some of you purists out there might be holding your chest and gasping for breath right about now but let’s see what else can be done with this car. I wanted to keep it a period custom so I used the design elements that were prevalent at the time. It just seemed obvious to me that a ‘63 Corvette fast back roof would look great on this car. I had been thinking about it for some time and decided to go for it. There is something about the opposing angles of the fins swooping up and the top line flowing down that just looks good to me. Sure this is a fiberglass Chevy part on a steel Ford but on a model you can get away with it. Since the Predicta was modeled 1/24 scale I used the Monogram 1/24 scale ‘65 Corvette as the donor car. The split may have to be borrowed from an AMT kit. The roof has to be stretched a bit above the door area to fit the proportions of the Predicta. I didn’t care for the stock Corvette door cuts and elected to make this car a two-door hardtop, in other words, frameless door glass. The roof section is mostly stock but I filled the “C” Pillar vents and the circular gas door. I decided to make the taillight-opening bevel inward (a late 50’s design element). I replaced the vintage grille-work with a single bar and six taillights. I added a custom steering “wheel”. Sorry guys but I really don’t care for the joystick in the center consol. The car was also lowered compared to the stock Monogram kit, which I felt sat too high. I think it created a nice look for the car. I also thought a salt flat racer was a good build option for the Predicta. It has a generally rakish look anyway. In this instance I filled the interior opening and left a single cockpit. The car needed to have a stripped-down look so I indicated the door panels were removed and used a flat filler for the grille with large perforations. This is an option that was used on other vintage salt flat cars. For this kind of racing all you need is about 1/2 inch clearance under a real salt flats car. So it is pretty low. The Ala Kart is clearly one of the best-known roadster pick-ups from the golden age of customizing. I wanted to see what it would look like with a different body. A coupe would look too much like the pick-up so I opted for a tub body. Now you may remember a modern Ala Kart made up as a tub. 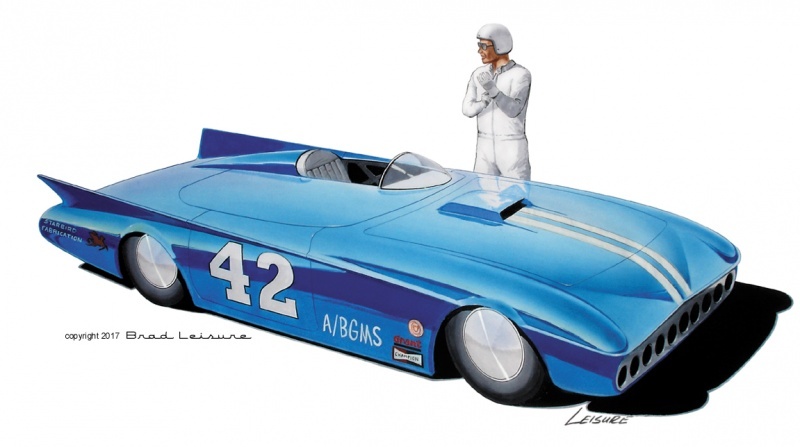 That car appeared over two years after this illustration was published! This was the Silhouette. The AMT Silhouette has a custom racing version already in the kit. I wanted to take it a bit further. First of all, I like round tail-lights more than the original horizontal actual bar. So for the race version they had to be covered over. I also like the look of the vintage racing wheels so I put on a set and illustrated them in a suitable color. Once again I covered the passenger seat with a hard cover and used a cut-down windshield. Finally, I wanted to see the Silhouette as a gentleman’s roadster. What if it was a stock production car from back in the day? So, it seemed to me that it needed wire wheels and just for fun I added a spare tire on the deck lid. Side pipes were given a more 60’s GM look with a textured side panel and rectangular slots. I also added Corvette style fender bulges front and rear on both versions. This one has a shaker hood scoop and sharper fender lines. These are just a few of my old ideas, I hope that some of you kit builders have been inspired to try new things on these vintage icons of customizing! In case you’re interested, most of these were illustrated on either bond marker paper or velum using art markers and pastels for the “air-brushed” gradations. Prismacolor pencils for the fine lines and “designers gouache” paint for the highlights. I always enjoy seeing your designs. Great work. I had a lot of fun building each of these kits when they were new. They were a significant part of the car culture in the 1960’s. I can also remember looking at the Silhouette model and thinking that it would be a good candidate to be turned into a slot car, (remember how big slot car racing was back then?). My idea was that the running gear would be mounted directly to the Silhouette’s belly pan monocoque style without a metal frame. Cox did this on some of there slot cars such as the Ferrari Formula 1 racer.